"Thlocklo Tustenuggee, or Tiger Tail," a prominent militant among the Semiinoles. Engraving from Sprague's 1848 history of the war. A leader since at least 1823, Tiger Tail was well known to the white residents of Florida from his long association with the prominent Tallahassee banker Robert Gamble. 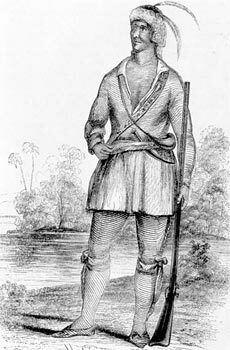 The chief frequently resided at the Gamble household, and once war broke out, he took special cares to spare the family and property of his friend. Based on Tiger Tail's familiarity with whites, this engraving was presumably made from a life sketch, like other works in Sprague's book. In Florida, Seminoles completely rejected the Treaty of Fort Gibson. They said that their delegates had been tricked and that the six chiefs had had no right to speak for the entire nation. Fearing for their lives, the delegates themselves disavowed their actions. Diverse elements of the tribe now took an adamant stand against emigration. Confrontation seemed imminent.